Why do some of the most intelligent people sabotage their own success? It all goes back to unconscious – negative – every day thoughts, also called cognitive distortions, first identified by psychologist Aaron Beck and Dr. David Burns. It’s typical to fall into these irrational thoughts every now and then. Mindset missteps are common among even the brightest, most well-meaning people. We can all relate to that feeling of sometimes getting in our own way. It’s simply part of being human, an evolutionary response designed to keep you safe and protected. Nevertheless, irrational thoughts can get in your way of success and taking necessary, healthy risks. For example, your inner critic may tell you you’re not good enough and that you’ll most definitely fail. Cognitive distortions also complicate our relationships. You project that your boss is upset when you make a mistake or worry about how your friends and family perceive you. Here’s a look at the most common cognitive distortions defined by Burns, along with examples of ways it may pop up in your life and work. Mental filter. You pick out a single negative detail and dwell on it. You may receive lots of positive comments about your presentation at work, but if one colleague says something mildly critical, you obsess about it for days. All-or-nothing labeling. You see things in black and white. If your boss says you did not meet expectations in a single category on your performance review , you label yourself as a “complete failure” at your job. With this way of thinking, there’s no room for nuance– there can’t be parts of your job you’re great at, while also aspects of your position you need to work on. Discounting the positive. It’s common practice for you to downplay positive experiences by telling yourself they don’t count. If you do a good job, you reason that anyone else on your team could have done just as well, so what does it even matter? “Should” statements. Instead of focusing on how best to handle situations for what they are, you demand they turn out as hoped. These “should statements” directed against yourself lead to guilt and frustration, such as “I’m an adult. I should have figured out my passion by now”. When directed against other people, they lead to anger and resentment. “My team should be able to handle this without bothering me,” is a good example. Personalization and blame. This cognitive distortion causes stress when you hold yourself personally responsible for an event that isn’t entirely under your control. For instance, when you’ve hit a bump in the road with a co-worker you think, “This is all my fault,” instead of trying to pinpoint the cause of the problem so you and your coworker can get back on the same page. Meanwhile, it’s also common to blame your circumstances on others and discount the ways you might be contributing to the problem. Did any of those thought patterns ring true for you? It’s time to retrain your mindset so that you can beat these irrational thoughts. The next time you find yourself falling into these unhelpful thought patterns, try this research-backed method adapted from cognitive psychology proven to help you change negative thoughts that contribute to anxiety, self-doubt, and Imposter Syndrome. 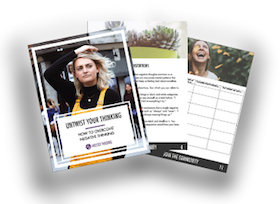 Get the workbook plus exclusive resources and updates when you join my email list.